On August 25th, the third of our 2015 series will take us to the City of San Gabriel. APA members and friends will be treated to a tour of Mission District, followed by a visit to La Laguna, and a bar/restaurant crawl on Valley Boulevard. 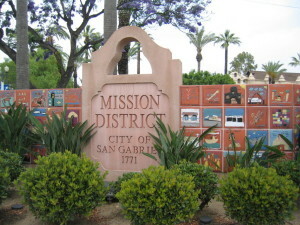 City of San Gabriel planning staff will discuss their most pertinent planning efforts throughout the tour. Parking/Transit Information: Parking is available at City Hall as well as behind the San Gabriel Mission Playhouse.